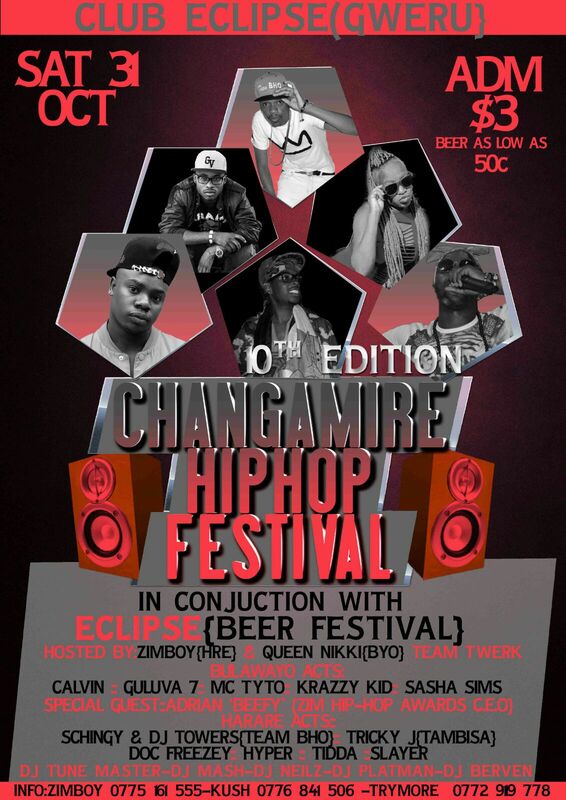 Jackson De Zimboy must be a very content man right now.The Changamire Festival founder delivered Zimhiphop to Gweru and the urban youths came out in droves to support.Despite the show starting later than the advertised 1900 hours,Zimboy and his co host the vivacious Nikki of Twerk team fame did a great job playing hosts and the headline acts Team Bhoo,Cal Vin,Guluva Seven and Slayer delivered commendable perfomances.The Dj of the night Platman Styles had the club groovy from the word go till activities died down. Cal Vin brought his YOTV experience with him as the crowd ate out of his hand singing along to his recent work and a little of the old.The sheer number of revellers who flocked to have pics with him taken are a testament of how much of a brand he has evolved into.Guluva Seven also represented Bulawayo to the fullest sampling his new project Color Of Dreams.He rose above the technical glitches to create believers of scores of fans who before the show,might not have known him.After the microphone died a few times too much during his set mumbles of sabotage were heard in the crowd. Team Bho were in familiar territory and their peers from Midlands State University showed them love from the onset.The "UBAs" and "USAs" took to the dance floor and started screaming Eeh Bhooo as Shingy and Towers perfomed Move,Hamuko,Bho and hatitambwe idzodzo before throwing shade at their recent rivals.Dj Towers took a swipe at Rehab boss Anonzi Xndr shooshing the crowd and saying 'F **k Xndr i won an award for saying They call me Dj Towers,what has Xndr done.' Shingy had a word or two for Stunner stating he had no beef with Stunner since he is in a better realm than the Tazoita Cash boss,shots fired......again. MSU student and Dollarsign recording artist Slayer was the last to bless the stage and after several exceptional performances the pressure was on him to deliver.He did so without breaking a sweat and when quizzed about the #IwannaKissTraeYung tee he was rocking he hinted a joint was in the works. Besides the general public a few notable personalities were also in attendance from rapper Meister, photographer/visual wizard Quence Motion, Krusty Da Mc of Kasi Lunatics fam and 2014 ZHHA journalist of the year Sindiso Dube.Congratulations to Zimboy for an epic night and to Club Eclipse for giving local hiphop a plattform to shine on.Despite the late start and a few uninspiring acts the night was on point and another victory in Zimhiphop's struggle for recognition.